Naked ‘To Die For’ Banana Bread is currently being tested at three of its seventeen vendor locations: Milano on Denman, Milano in Gastown, and Milano on 8th Ave. The recipe is identical to the original flavor (Macadamia Nut Callebaut Milk Chocolate), minus the nuts and the chocolate. Please note that this new flavor is produced in a facility that contains nuts and may contain traces of nuts. 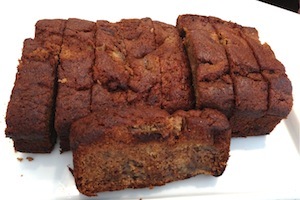 Hopefully those of you on the look-out for healthier options will enjoy the new Naked Banana Bread, which is sweet, salty, and extra moist as usual. Its ingredients are all-natural, its eggs are free-range, its bananas are organic, and its vanilla is pure.